Beta 2 of the Entity Framework Power Tools was recently released. By far the most popular feature out of these power tools is the ability to reverse engineer a Code First model from an existing database. Admittedly ‘Code First’ wasn’t the best choice of names… Code First is really just a code-based alternate to the EF Designer, it supports creating a new database or mapping to an existing database. Using Code First against an existing database is often called ‘Code Second’ because… well… you have the database first and then write the code second. I’ve included a download of the modified templates at the end of this post. If you are already familiar with ‘Reverse Engineer Code First’ then skip ahead to the next section. You’ll need the EF Power Tools installed from Visual Studio Gallery. 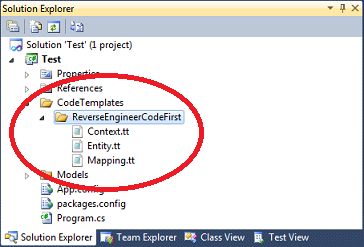 If you look in the mapping classes (those are the ones in the Mapping folder) you’ll see that ‘Reverse Engineer Code First’ uses the Fluent API for all it’s configuration. A common request is to use Data Annotations for configuration, rather than the Fluent API. You’ll also see that it generates table\column mapping code for all classes/properties, even though Code First would correctly work most of these out without configuration. Let’s modify the code generation so that column and table mappings are done with Data Annotations and are only generated when required. This will add a set of T4 templates to your project. The Power Tools will use these templates to generate the code for the various classes it adds to your project. Note: You may see the following error after you add the templates. This is safe to ignore. 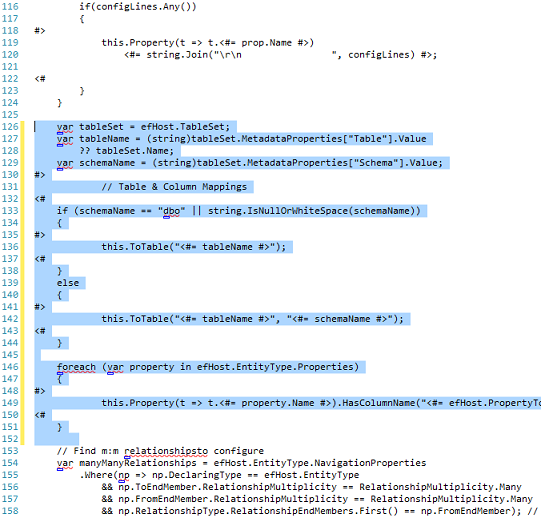 It’s a result of Visual Studio trying to validate the templates… but they are never run from your project. The first step is to stop generating table and column mapping in the mapping classes. This is the easy part, in Beta 2 of the Power Tools just delete line 126 thru 152 (inclusive) from the Mapping.tt file. Now it’s time to edit Entity.tt to include the [Column] and [Table] attributes where required. Let’s start by generating a [Column] attribute for any properties whose name doesn’t match the column that they map to. This can happen when the column name contains characters that aren’t supported by C#. For example the column name may have a space, the reverse engineer process will generate a property that uses an underscore instead of a space. 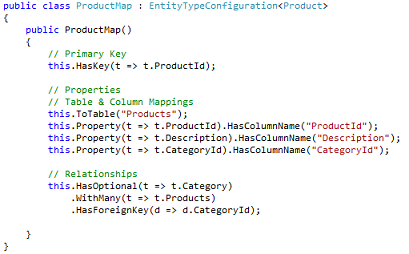 If we don’t supply any mapping then Code First will look for a column with an underscore instead of a space. In Beta 2 you’ll find the property generation code around line 39 in Entity.tt, add the highlighted section from the code below. Next we need to generate a [Table] attribute when the pluralized name of the class doesn’t match the table it maps to. This can happen if the table name is not pluralized in the database. 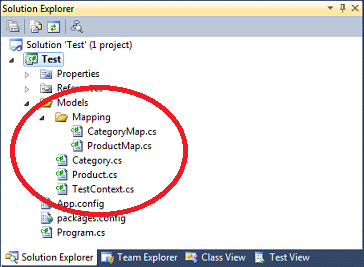 For example, if you have a table named Category then the reverse engineer process will generate a class called Category. 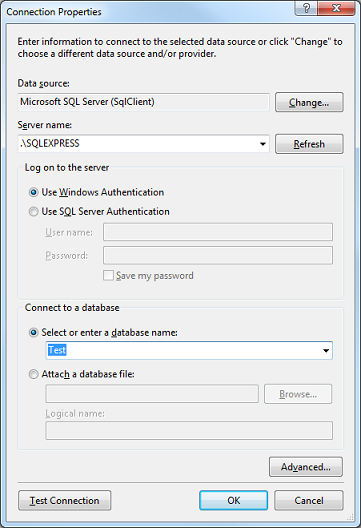 If you don’t supply any configuration then Code First will look for a table called Categories in the database. We also need to specify configuration if the table is not in the dbo schema. In Beta 2 you’ll find the code that generates the class definition line around line 13 in Entity.tt, add the highlighted section from the code below. The final step is to modify the template to generate a using for the namespace that the Data Annotations reside in. 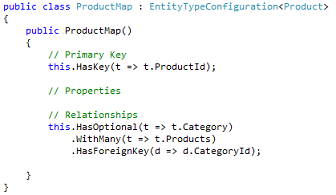 Add the highlighted code under the existing usings (around line 10 in the Beta 2 version of Entity.tt). The namespace for the Table/Column annotations changed after EF4.3, so we check which version we are using and generate the correct namespace. Now that we’ve made the edits you can re-run the reverse engineer process – make sure you save the changes to the tt files before you run it. ← What tables are in my EF model? And my Database?